The Prime Minister Narendra Modi-drove government has been extremely idealistic about its Goods and Services Tax (GST). This routine which at long last observed reality back in July 2017, was dependably on and off the table since the previous 16 years. Henceforth, GST is one of the greatest change made by the Modi government. Curiously, in Budget 2018, the legislature made an extremely strong move and declared a GST income focus for FY19 to Rs 12.9 lakh crore. Be that as it may, resembles this routine may play a downer for the NDA government as they may miss the mark regarding Rs 1.5 lakh crore in their GST income focus for FY19. CLSA says, "We gauge an absolute FY19 GST setback at Rs1.5trn or 80bps of GDP. While this is generally to the Central Govt's record, since the Central Govt shares 42% of its own incomes with states, the deficiency will successfully reflect for both state and focal govt." Information up till December 2018 is given by Ministry of Finance, which demonstrates that all out gross GST income remained at Rs 94,726 crore in the most recent month of 2018. From which CGST came in at Rs 16,442 crore, SGST at Rs 22,459 crore, IGST is Rs 47,936 crore (counting Rs 23,635 crore gathered on imports) and Cess is Rs 7,888 crore (counting Rs 838 crore gathered on imports). Complete income earned by Central Government and the State Governments after standard settlement in the period of December 2018 is Rs 43,851 crore for CGST and Rs 46,252 crore for the SGST. GST income for FY19, which implied on a month to month premise the accumulation apparently came at Rs 1.07 lakh crore. Month to month premise target is as yet a lost drift for NDA government. Most minimal GST income accumulation came in amid August 2018, where it remained at Rs 93,960 crore. It was in the start of monetary year FY19, when GST income stood most noteworthy over Rs 1.03 lakh crore in April 2018. Over Rs 1 lakh crore income was then gathered following a five months hole later in October multi month. In any case, end of 2018 was not searching useful for government, as GST income decelerated to Rs 97,637 crore in November 2018 and further to Rs 94,726 crore in December 2018. Generally speaking in nine months, GST income remained at a total Rs 8.71 lakh crore which misses the mark concerning Rs 4.19 lakh crore to meet the financial plan 2018 target. Considering just three months are left for FY19 to end, CLSA accepts by end of this financial government will see the loss of Rs 1.15 lakh crore GST income target. 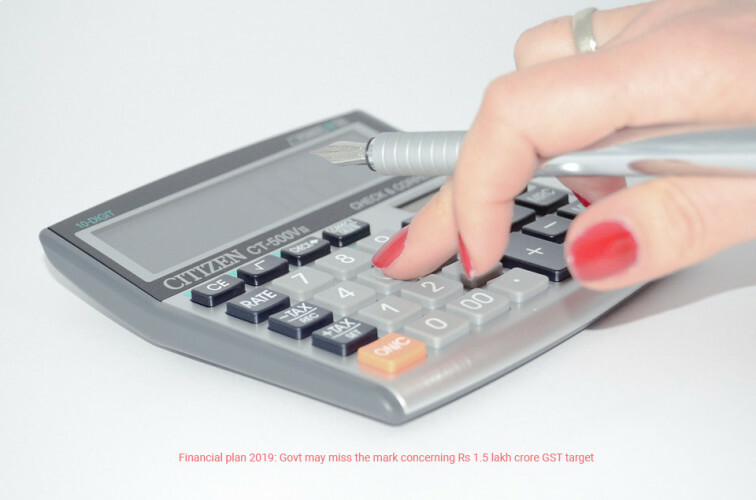 Along these lines, CLSA includes that the expansive GST deficiency keeps absolute circuitous expense development at just 6% versus 23% planned. In CLSA's view, this will imply that the great development in direct assessments (17%, close target) in any case, Center's net (of state share) impose accumulations would be 8ppt/Rs1.0trn shy of the objective. Thus, for Budget 2019, CLSA trusts, potential consistence enhancement should drive a GST development of 20% amid FY20.